WASHINGTON – It’s 8 a.m. on a recent Wednesday and Rep. Debbie Lesko is standing in the Capitol’s Statuary Hall, steps from a larger-than-life statue of Arizona Sen. Barry Goldwater, waiting for a live television interview. It’s the first event in a 12-hour day that will include meetings, interviews, votes and hearings – a normal Wednesday for members of Congress, in other words. With the House on recess for the month of August and a gridlocked Congress unable to pass much legislation, it’s easy to think that lawmakers aren’t working hard. But that confuses their work product with their work ethic, said Brad Fitch, CEO of the Congressional Management Foundation. For Lesko, the day starts with a mile-long walk to work in flip-flops with her husband, who carries her black Swissgear backpack for her. After wrapping up her 8 a.m. interview, she gets a hello from House Speaker Paul Ryan as he walks by. “I’m from Wisconsin, so he always brings that up,” said Lesko, who grew up Kohler, Wisconsin, before moving to Arizona in 1985 with her ex-husband. 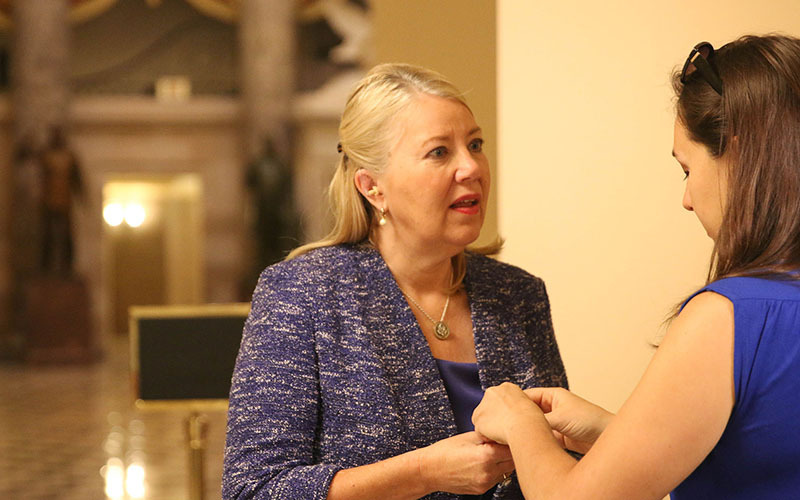 She got her start in politics as a PTA mom at Peoria schools, eventually making her way to the Arizona State Senate. A Republican, she won the special election in May to replace Rep. Trent Franks, after he resigned in the face of a sexual harassment probe. “My phone started going crazy,” with people urging her to run, Lesko tells a group sitting in her Rayburn Building office for her first “Coffee with Constituents” event in Washington. She spends nearly an hour with the group. She talks about everything from surviving her ex-husband’s domestic violence – “There was definitely times in my life where all I cared about was existing” – to adjusting to life in Washington. “Holy mackerel, this is an expensive place,” she tells her constituents. Lesko rents a 10th-floor apartment in Washington’s Navy Yard neighborhood, where she doesn’t have a car and walks to get groceries – a big adjustment from the sprawl of the Valley. After her constituents head out for tours of the Capitol, Lesko goes over the day’s schedule with her legislative director, then scurries out the door to a House Science, Space and Technology Committee hearing on cost overruns of the James Webb space telescope. Two hours later, Lesko leaves the hearing and heads back to her office where she takes a break – sort of – to study Medicare legislation. Next up is lunch with the Republican caucus, a time for GOP lawmakers to get support on bills and get to know their colleagues. Lesko says lunches like these, along with Republican Bible studies, are how she’s learned to network in Washington. At 2 p.m., she’s on the House floor to vote on veterans and flood insurance bills and to drop off a resolution of her own while she’s there. By 2:30 p.m., she’s at a hearing of a Homeland Security subcommittee, where she waits for an hour before she gets to ask her first question of the panel of agency leaders. She wants to know what the Homeland Security Department is doing to help Arizonans during wildfire season, and is told about drone-based LTE connections that can provide cellular service in the midst of a wildfire. By 4 p.m., Lesko is back in her office for an interview and to study material for a 4:45 p.m. meeting to lobby for a committee leadership position, armed with a letter of recommendation from Gov. Doug Ducey. “It’s a grueling schedule,” said Kolbe, a Republican who represented the Tucson area from 1984-2006. “And you have to divide your time between Washington and your home district. Lesko travels to her district every two weeks, where her youngest son, 20, lives at the family’s Peoria home. But, as Kolbe noted, a trip back to the district typically involves a packed schedule of meetings with constituents. The pace lets up only slightly during recess. when lawmakers go home for face-time with constituents, both as lawmakers representing them and candidates seeking their votes. By 6 p.m., Lesko is back on the House floor for votes. An hour later she gives a floor speech on military readiness, focusing on Luke Air Force Base, which is in her district. At 8 p.m., 12 hours after her first appointment of the day, Lesko returns to her office where her husband is waiting for her. 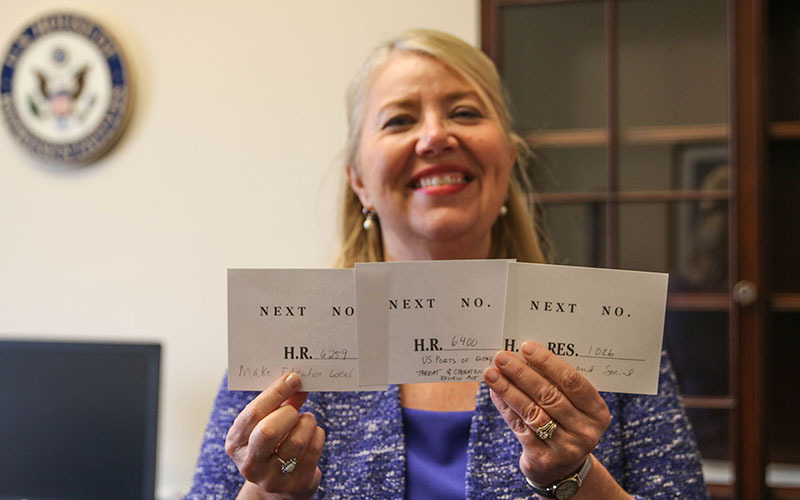 After staff hands her a pile of documents to study, including her “Wednesday Take Home” folder, Lesko heads out the door for the evening – which she often spends on the roof of her apartment, sipping a beer with her husband, looking at the Capitol dome.